We have been warned not to get under one another's skin, to keep our distance. But Jordan Peele's horror-fantasy-in which we are inside one another's skin and intimately involved in one another's suffering-is neither a horror nor a fantasy. It is a fact of our experience. The real fantasy is that we can get out of one another's way, make a clean cut between black and white, a final cathartic separation between us and them. For the many of us in loving, mixed families, this is the true impossibility. There are people online who seem astounded that Get Out was written and directed by a man with a white wife and a white mother, a man who may soon have-depending on how the unpredictable phenotype lottery goes-a white-appearing child. But this is the history of race in America. Families can become black, then white, then black again within a few generations. And even when Americans are not genetically mixed, they live in a mixed society at the national level if no other. There is no getting out of our intertwined history. Zadie Smith, "Getting In and Out," Harper's Magazine, July 2017. https://harpers.org/archive/2017/07/getting-in-and-out/. The Katherine G. Johnson Computational Research Facility at NASA’s Langley Research Center in Hampton, Virginia. U.S. Sen. Mark Warner, Virginia Governor Terry McAuliffe, and author Margot Lee Shetterly are among the dignitaries honoring Katherine Johnson, former NASA employee and central character of the book and movie Hidden Figures, at 1 p.m. [EDT] Sept. 22 at NASA’s Langley Research Center in Hampton, Virginia. They will join Hampton Mayor Donnie Tuck and Langley Center Director David Bowles in cutting the ribbon to officially open the center’s new Katherine G. Johnson Computational Research Facility, a state-of-the-art lab for innovative research and development supporting NASA’s exploration missions. The event will air live on NASA Television and the agency’s website. Media wishing to attend must contact Michael Finneran of the Langley communications office at 757-864-6110 or michael.p.finneran@nasa.gov. Johnson, 99, will attend and participate in photo opportunities, but will not be available for interviews. A prerecorded message from her will be aired during the ceremony and a statement will be read. Johnson was a “human computer” at Langley who calculated trajectories for America’s first spaceflights in the 1960s. The retired mathematician was awarded the Presidential Medal of Freedom, the nation’s highest civilian honor, in 2015. Her contributions and those of other NASA African-American human computers are chronicled in the 2016 movie Hidden Figures, based on Lee-Shetterly’s book of the same name. She worked at Langley from 1953 until she retired in 1986. The Katherine G. Johnson Computational Research Facility (CRF) is a $23-million, 37,000-square-foot, energy efficient structure that consolidates five Langley data centers and more than 30 server rooms. 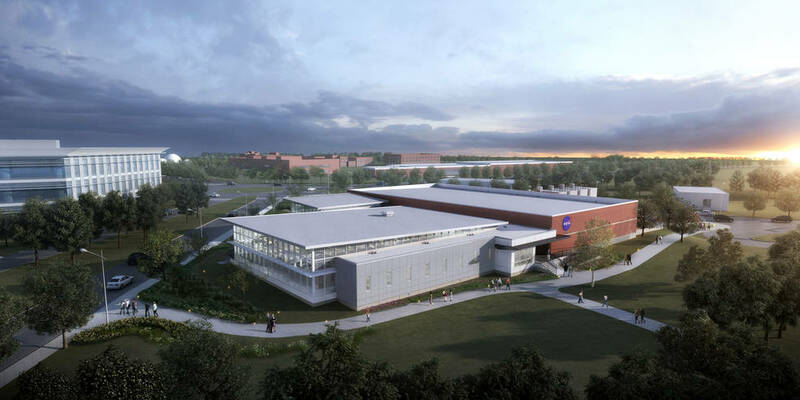 The facility will enhance NASA’s efforts in modeling and simulation, big data, and analysis. Much of the work now done by wind tunnels eventually will be performed by computers like those at the CRF.